Scorpio is the 8th astrological sign in the Zodiac that originates from the constellation of Scorpius. People born between 23rd October and 21st November fall under this Scorpio zodiac sign. It is one of the 3 water signs which is a fixed and negative sign. Now, as this is a water sign, Scorpions are very emotional in nature. Just like the varied depths of water – shallow or deep as an ocean – the emotions of Scorpio also have a wide range. One can never say how this zodiac sign is going to react under varied situations. Just like the deep ocean, a Scorpion also carries many secrets and that adds to their magnetic and secretive aura. The ruling planets of this sign are Pluto and Mars. Mars is the planet of outward activity and passion and the great courage, volatile temper, and that fierce personality are thus drawn from this planet. Pluto brings intense passion and ruthlessness to a Scorpion. Additionally, it also brings transformation. Lucky Numbers: 9 & All Multiples of 9 like 18, 27, etc. Weaknesses: Does Not Trust Anyone, Jealousy, Violent, Secretive. Famous Personalities: Pablo Picasso, Julia Roberts, Shah Rukh Khan, Matthew McConaughey, Ryan Reynolds, Katy Perry, Aishwarya Rai Bachchan, Voltaire, Anne Hathaway, Ryan Gosling, Martin Luther, Bill Gates etc. 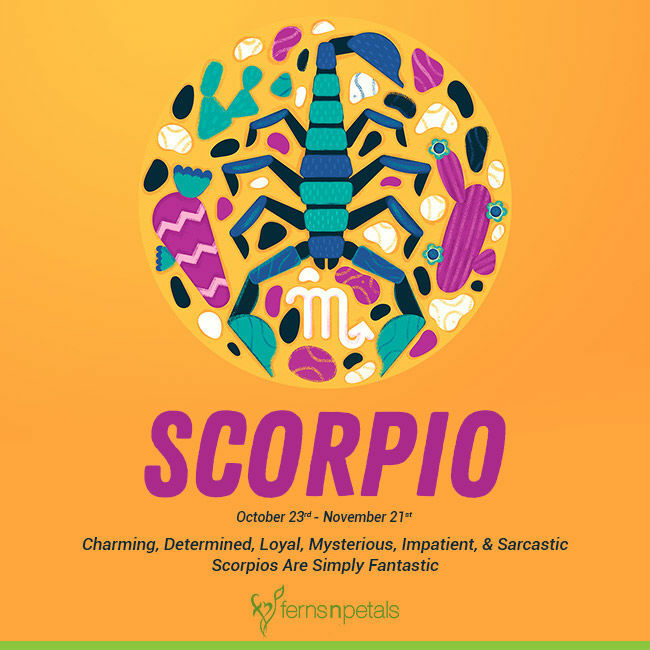 Scorpio is full of mystery! Passion and courage are the other words to define them. You may think that you have befriended a Scorpio and know them really well…. Ahem! A Scorpio will never ever bare themselves completely to anyone – be it their parents, best friends, love interest, etc.! They will always have a doubt in their minds about anyone and everyone. It’s just that they don’t like being vulnerable in front of people. But that doesn’t mean, they don’t love people. They do – with all their heart and soul love people who reciprocate their feelings but won’t think twice before destroying someone if they are hurt. Don’t forget: Scorpios have the most beautiful eyes and their stare are hypnotizing for sure! The charming attitude of Scorpio is something that makes them stand apart from the crowd. To make their presence felt among people, they hardly need to talk or make a move. There is some kind of magnetism in the way they walk or talk and people die to pay their attention to them. The party really starts after the arrival of a Scorpio! Scorpios always have to speak the truth – harsh ones! The thorny truth that can sometimes hurt others – are uttered by Scorpio personalities. Because they are 100% honest and thinks that the world has to deal with the not so comforting truth. There is simply no room for cheaters or dishonest or disloyal people in the world of a true blooded Scorpio person. Loyalty is the keyword for Scorpions. They are 1000% loyal and faithful to their friends, family, partners, organization, etc. But when you fail their loyalty test, you should better exit yourself because in case you don’t, you surely won’t be able to digest the insult a Scorpio would throw at you. If you are dating a Scorpio personality, then you simply cannot be late! They move on easily because they simply cannot wait for you at a theater or a mall. Similarly, they are impatient to wait for something to happen. They just love to walk ahead and despise the “slow” movement of traffic or people! If you know a boss who would always find a fault in your PPT’s, then probably he/she is a Scorpio. In the dictionary of a Scorpio, there is no space for mediocrity and they are always in the path of refining themselves and their subordinates to achieve excellence. That’s why they sound intimidating to some people. Thus, if you are working with this personality, then there is huge chance of improving the self too. Scorpio personalities are courageous, passionate, truthful, full of facts and figures, and fighter. These are the qualities one requires to win any argument which every Scorpio personality carries with abandon. They would bring some facts and figures from 20-50 years ago to win the argument against you. In that perspective, they have an elephant memory. Added to that is a “never give up” spirit which makes them winners at any argument. Scorpios are quite peaceful people until and unless you start messing in their territory. If they find you messing with their loved ones, interests, or peace, then you probably should buy the ticket to some other place. Even then you cannot hide though! Because they will find you to punish you & teach you a lesson! So, never ever mess with a Scorpio. They are intelligent and witty. The fact is that they know they are witty and intelligent and that’s why they use Sarcasm as their instrument. When it comes to sarcasm, there cannot be anyone who can surpass their talent. They have all the qualities to even run an institution to teach sarcasm to needy people! People may later make fun of it or criticize this nature – but those funny and sarcasm-filled one-liners are the secret pleasure for people. That’s, by the way, one of the reasons behind the huge popularity of Scorpio people! Their superb attitude of getting it all or nothing at all is something that sets them apart from all other signs. If they are participating in a game, they have to win it otherwise there is no point in taking part in it – as simple as that! If they are not winning, then they think that their time is wasted. As stated earlier, they carry a “never give up” attitude and that helps them a lot in winning too! Scorpios are actors by birth because they are masters at hiding their feelings brilliantly from people. Whatever is going inside their head or heart is hardly seen on their face. They believe – no matter in what situation you are, you must get up, wear some makeup, and never give up. So, if you think that you know your Scorpio friend too well, then you must think twice. They and their diary or mirror only know their truest self! A Scorpio personality is also someone who is unapologetically ambitious. Moreover, when others give up out of boredom or tiredness, Scorpios are still working hard because they are simply driven by ambition and passion. So, can you ignore this charismatic Scorpio? You better not! However intimidating, sarcastic, or badass they are – if you are a friend to a Scorpio, you are a lucky one! Their birthday time has started and thus you must greet them with interesting gifts like – diary, organizer, personalized laptop cover, personalized banner, unusual gifts, etc.